Pedicures can sometimes be about more than just feeling pampered. While a professional pedicure is pleasurable, it can also benefit the health of your feet and toenails. That’s especially true if you have a fungal infection. But finding the best pedicure kits for people with nail fungus is essential because you need the ‘right’ tools. Pedicures don’t necessarily mean that you have to go to a salon. While professional nail grooming can be fun, it’s not the best solution for dealing with toenail fungus. In fact, nail salons can be a cause of nail fungus. Even the most professional salons make mistakes. Toenail fungus can be triggered by trauma to the nail as it provides an easy means of access. If a pedicurist accidentally digs underneath your nail with a tool, an infection could occur. Using a pedicure kit at home can keep your nails to become healthy and look great. You can achieve some of the salon-style benefits of a great gel pedicure, in the comfort of your own home. Plus, with your own tools, you’re able to reduce the risk of infecting other nails. 1 What Is Included with a Pedicure Set for Toenail Fungus? 3 How do the Best Pedicure Sets Work? 5.1 What Kind of Tools Does it Have? 6 Are There Any Safety Concerns? What Is Included with a Pedicure Set for Toenail Fungus? 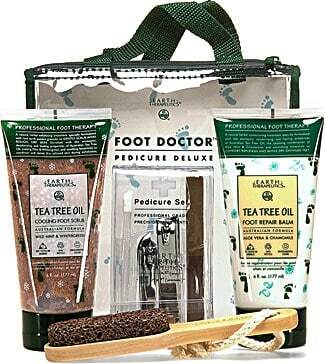 A traditional pedicure kit contains tools and accessories designed to make your feet and toes look and feel better. They can include everything from nail clippers to files that remove calluses. Pedicure kits are meant to remove imperfections. Most quality pedicure kits contain salon-grade tools. It’s a great solution for getting a professional pedicure at home, instead of having to go to an expensive salon. But, when considering a pedicure kit for nail fungus, there are additional components to consider. Pedicure kits can help to treat some of the symptoms of nail fungus. In order for a fungal infection to be treated, some type of antifungal solution must be used. There are plenty of good options, such as the Purely Northwest system. They range from over-the-counter solutions to prescription medications. Unless a pedicure kit specifically contains any of these solutions, it can only combat the symptoms, like hard nails. How do the Best Pedicure Sets Work? Some will also contain oils, ointments, and creams. Other kits focus on the actual feet more than the toes. These often contain electric or battery-powered devices that are designed to remove calluses, corns, etc. The best pedicure kits will have a bit of everything. They should contain more than just tools designed for vanity purposes. The nails can become thick, brittle, and unsightly. Working with strong enough tools is important. Sometimes, if a kit contains the right kind of oils or ointments, those can help if they contain antifungal properties. One of the better options is tea tree oil. Keeping your toenails and feet healthy is important. Basic hygiene makes it harder for the fungus to grow and thrive. And, keeping nails trimmed and clipped short will also make it harder for it to spread. We’ll take a look at five of the best pedicure kits you can use if you have a fungal infection. Each kit has unique features. They are some of the best available when it comes to keeping your toes healthy and hygienic. This is an all-in-one tool. It features various attachments for one battery-powered, hand-held tool. These attachments all do different things. Some are meant for the nails directly, while others are meant for other parts of the feet, to remove calluses, etc. If you’re looking for a compact, motorized tool to grind down thick nails, this set is a great solution. It’s small enough to travel with you and powerful enough to work with even the toughest nails. Plus, the various attachments will help your feet to look better. 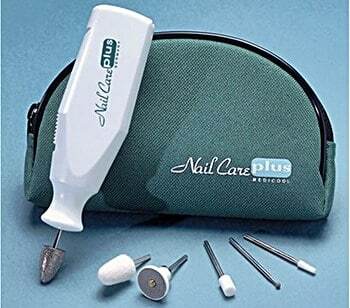 Find Out the Current Price for the Nail Care Plus Personal Manicure/Pedicure Set! This unique kit from Earth Therapeutics features many different products in one convenient set. With professionally-designed tools and healing therapeutics, it’s unlike many of the other traditional pedicure sets on the market. The great thing about this set is that it features tea tree oil components. Again, tea tree oil has been known to help heal toenail fungus. With its antifungal properties, using the tea tree oil balm and scrub can help fight back against a fungal infection. Find Out the Current Price for the Earth Therapeutics Foot Doctor Kit! The appeal of this set is its durability and strength. With a variety of professional-grade tools, you can take care of your nails and leave your feet looking great. The company behind this set is so confident in its strength it offers users to compare it to other sets. Overall, the strength of the tools in this kit make it a great solution for taking with you on the go. 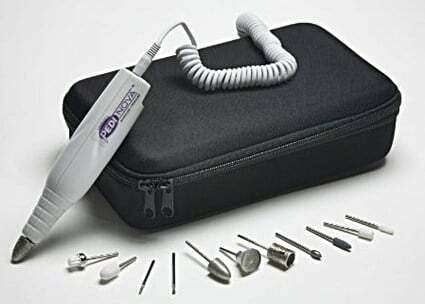 However, with a case that unfortunately may not close all the way, you may be better off using the tools separately in your own tote or carrying case. 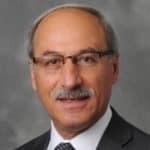 Find Out the Current Price for the Drs. Pro Choice Pedicure Set! This kit has the right amount of power and all the tools necessary to work with even the toughest, thickest nails. It is a podiatry-grade electric nail grinder. The bits and attachments included are specially designed for hard nails. Once the nails have been ground down to a manageable thickness, you can use the other tools to polish and smooth. That can help with the unsightliness that typically goes along with a fungal infection. Because of its power, strong tips, and durability, this kit is a great solution. If you’re dealing with nail fungus, it can work with thick nails and help you keep your toenails clean and trimmed while you’re going through another treatment option. 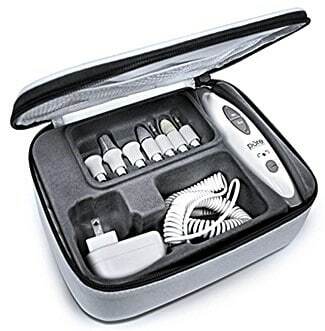 Find Out the Current Price for the Home Pedicure PediNova III - Electric Manicure Kit by Medicool! This kit provides salon-grade pedicures at home. You can take comfort in knowing the attachments and tips are completely sterile and won’t trigger the growth or spreading of a fungus. This set has seven interchangeable tips to grind down nails, smooth, and shape. This kit is great for constant, consistent power. If you have thick nails to grind and shape, it definitely does the trick. That power seems to be a bit too much for some when they hold onto it with one hand, so it may be better to use this kit in short increments. Find Out the Current Price for the Pure Enrichment Pedicure System! What Kind of Tools Does it Have? A pedicure set that contains a thin set of nail clippers, a pair of scissors, and not much else likely isn’t going to do very much. The tools in one of these sets need to be strong. There should be multiple clippers that can reach the nail(s) at different angles. It doesn’t matter how many tools are included, as long as they are the right ones. If they can work with hard and brittle toenails, quality will beat out quantity every time. Along with tools for the feet, many kits also contain general beauty tools and accessories. These range from eyebrow tweezers to ear picks. These accessories are a matter of preference. But, if you’re focusing strictly on the health of your feet and toes, they shouldn’t play a big factor in your final decision to choose a certain product. Some pedicure kits contain more than just tools. For a full salon experience, they might contain things like oils, creams, and ointments. Typically, these are designed for things like softening the feet and adding nourishing moisture. However, the ingredients of these solutions can be important. Oftentimes, these products will contain certain essential oils. Certain solutions, like tea tree oil, have been known to help in treating toenail fungus. It is an antiseptic, antifungal, and antibacterial product. If a pedicure set contains extra creams or oils, be aware of what the ingredients may be able to do for your fungal infection. The kits themselves aren’t designed to treat toenail fungus. But, some of the solutions provided can help. Additional treatments can also be tools that are designed specifically for people with some type of health condition. Along with toenail fungus, other factors can play into thickening toenails, like age, or diabetes. A product that mentions a design designated for health should be considered an asset. The value of a pedicure kit isn’t necessarily based on how many tools it has. Rather, it should be based on how those tools function. Again, quality trumps quantity with the number of items in the kit itself. You may end up paying more for more tools, only to find you never use half of them. Instead, think about which tools you’ll use most, and choose a kit accordingly. Not only will it likely save money, but nothing will go to waste. One of the best parts of a pedicure set is the durability they hold. The kits are often meant for traveling, so you can take them with you wherever you go. Kits that have their own containers or bags that can close securely are the best when it comes to durability. If a pedicure set can’t fit in a suitcase, or travel safely, it may not last long. Or, you may simply not want to use it as much because of the hassle of keeping it all together. A set that is minimalistic and strong can be less expensive, and more useful. If it is hard to use, you won’t take it out very often. The tools should be high-quality, and sharp/strong enough to do a good job. It also shouldn’t be confusing when it comes to which tools solve which problems. It’s another reason to avoid sets that feature a ton of tools without much value. There are two main categories when it comes to pedicure kits. One type of kit contains quite a few tools. You’ll find clippers, scissors, and more in the ‘manual’-style kits. Other pedicure kits use electricity or battery power to work. The sets that use power mostly consist of one main tool, with several attachments that provide different benefits. Power kits can be great for grinding and sanding down thick toenails. However, if the manual kit has strong enough tools, it’s usually just as effective. Choosing what type of kit to consider is a personal preference. Make sure that you disinfect the tools before and after usage. Failure to do so could spread the infection. If the set comes with oils or creams, be aware of the ingredients. If you think that you may have an allergic reaction, avoid using that solution. The tools are designed to be sharp and strong. Always be mindful of the tools you’re using so you don’t cut yourself. With a little patience and extra care, pedicure kits are safe to use. Has your fungus healed? Keep using an at-home kit. You’ll know the tools are properly cleaned and you can make sure that they’re being used properly. Pedicure kits for nail fungus are about more than making your nails look good. Infected nails are hard and thick. So, it’s important to use a kit that can resolve those problems. Kits that have the right tools will be the best choices. Tools should be made of either stainless steel or a material that’s strong enough to clip through hard nails. Electric kits tend to fare better with the power needed for thick nails. The best pedicure kits for toenail fungus have some kind of power source. It can be a manual power that you produce yourself, or electric. 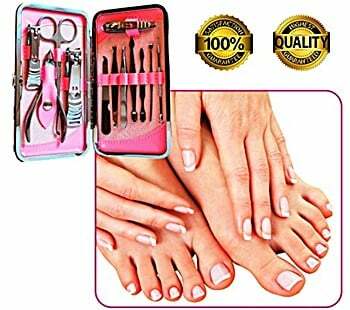 The Home Pedicure PediNova III - Electric Manicure Kit by Medicool offers enough power to grind down hard nails. It’s podiatry-grade strength and tools can work for just about any fungal infection case. It also provides extra tools to polish and smooth down nails when you’re finished. That can help to boost your confidence, even with nail fungus.